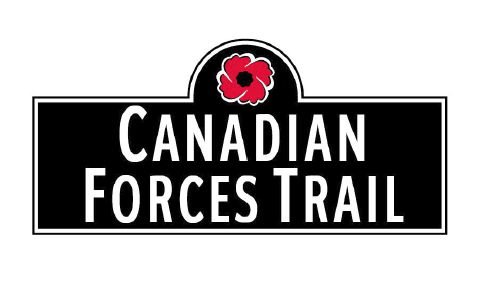 On June 26, the Naming Committee approved the honourary naming of “Canadian Forces Trail” along 97 Street from 137 Avenue NW to the City’s northern boundary. The naming application was submitted by Ward 3 Councillor Jon Dziadyk. The naming honours the relationship between the City of Edmonton and the Canadian Forces (Garrison) Base and the historical significance of the former Canadian Forces Base Griesbach, located west of 97 Street and north of 137 Avenue. Canadian Forces Base (CFB) Edmonton is the largest army base in Western Canada, and has a significant impact on the City of Edmonton’s local economy, with many military members living in Edmonton. For almost a century, 97 Street has carried soldiers between the bases, and served a principal route to the international airport for troops to deploy in the defence of Canada. Traditionally, Edmontonians have lined this street to wave good-bye or to welcome home troops. The naming also honours the sacrifices that Canadian soldiers and their families have made and the 100th anniversary to the end of World War One. On May 1, 2018 Hugh Bolton officially retired from his role at EPCOR, but his name remains in the fabric of Edmonton. As approved by the Naming Committee in December of 2017, 107 Street NW between 120 Avenue NW and 123 Avenue NW, now bears the honourary name of Hugh Bolton Way. This road segment connects to EPCOR's Hugh J Bolton Service Centre. Committee support for this naming was based on Hugh's long-standing work with volunteer organizations such as STARS, the Canadian Diabetes Foundation and the United Way. He also mentored students at the University of Alberta School of Business for two decades. His work in both the profit and non-profit sectors has brought benefit and recognition to Edmonton. Names for the stops and stations along the West extension of the LRT Valley Line were approved at the March 27, 2018 meeting. 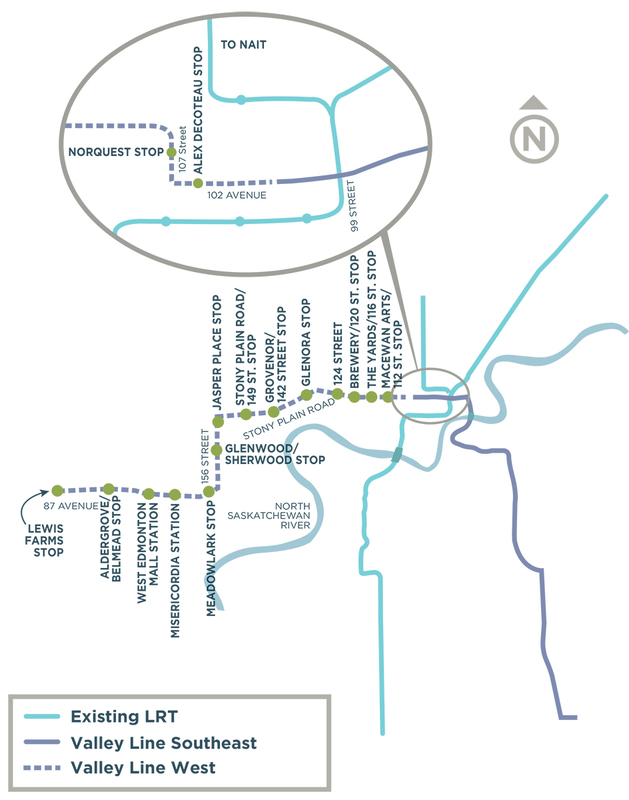 The committee wanted to ensure the stop and station names made navigating the city easy for all, while drawing attention to Edmonton's history, and reflecting community input. The stop/station distinction was determined by whether the line was at grade or elevated in keeping with the LRT naming conventions. For more information, or for a pdf copy of the map shown above, please see the Valley Line project page. In addition to a police facility, in 2016 a small green space was named for the officer that began the Edmonton Police Canine program. Located at 16448 104A Avenue NW (Lot P Block 5 Plan 4746KS), the recently installed sign honours Val's contribution to the Edmonton Police K9 Unit. For more information about Sgt. Vallevand, or a map of the park location, please see the Naming Committee Maps and Biographies page. The grand opening of the 100 Street funicular and lookout will take place on December 9, 2017 celebrating a new way of bringing Edmontonians into the River Valley system. The Edmonton Naming Committee determined the names of both the lookout and funicular in their August 2017 meeting. Edmonton’s River Valley, the largest urban park in Canada, is an asset that may never have existed without the efforts of Frederick G. Todd. As was common in most Canadian settlements, Edmonton’s river valley was used for industry and manufacturing leading up to the flood in 1915. Todd saw its potential as a recreation space, and developed a plan for the area focusing on preserving and enhancing the natural state. His plan was used as the guiding framework for the river valley after the waters receded. For more information about Frederick G. Todd, please read the Naming Committee biography. On January 31st, 2017, the Naming Committee approved the name for one of Canada’s first outdoor curated Indigenous art parks. The park will be known as ᐄᓃᐤ (ÎNÎW) River Lot 11∞, pronounced (EE-NU) River Lot 11. ᐄᓃᐤ (ÎNÎW) is a Cree word meaning “I am of the Earth”; the art park is situated on ancestral lands of the Indigenous peoples whose descendants entered into Treaty with the British Crown resulting in the territory being opened for settlement. River Lot 11 acknowledges the historic river lot which was home to Métis settler Joseph McDonald. The park is located within Queen Elizabeth Park in Edmonton’s North Saskatchewan River Valley. For more information, read the entire press release. In 2015, the Naming Committee approved the honourary road name "Vukovic Way", and in 2016, his son Bernard held an unveiling event. Ivan Vukovic founded Edmonton-based company NAMCO in 1976. Judy Padua was honoured during the unveiling of Judy Padua Way, an honourary road located Downtown between Rue Hull (99) Street and 100 Avenue behind the Edmonton Public Library. On January 26, 2016, the Naming Committee approved the renaming of 23rd Avenue between 215th Street and Anthony Henday Drive as Maskêkosihk Trail (pronounced 'Muss-Kay-Go-See'). Maskêkosihk is the Plains Cree name that refers to the land location of Enoch Cree Nation and is a derivative of Maskêkosak (pronounced 'Muss-Kay-Go-Suk') meaning "people of the land of medicine." The roadway is situated within traditional Enoch Cree Nation territory and will serve as a highly visible entryway into Enoch Cree Nation. The area between 184th Street and 23rd Avenue has served as a gathering space for Indigenous and non-Indigenous peoples for generations. Sharing a border, Enoch and Edmonton also share a dedication to reconciliation. As an on going effort to maintain accurate biographical information on individuals honoured through the Naming process, the Naming Committee encourages citizens to contact Administration with updated information and materials related to past naming approvals. Recently, Betty Mullen contacted Administration regarding road names approved in her honour in 2006. She provided new and updated information pertaining to her contributions to the City. Read more about Betty Mullen. If you know an individual who has been honoured through the Naming process and would like to share additional information, please contact our office. On September 22, 2015, the Naming Committee approved the naming of "Constable Dan Woodall Park" located in the South Terwillegar Neighbourhood. This park is named in honour of fallen Constable Daniel Woodall who was an avid soccer fan. The park will soon feature a soccer field, baseball diamond, and playground. Gord King is a Second World War Veteran and former Prisoner of War who was involved in the Great Escape. The Naming Committee recently approved Gordon King Pond and a network of King roadways within the Keswick neighbourhood in his honour. 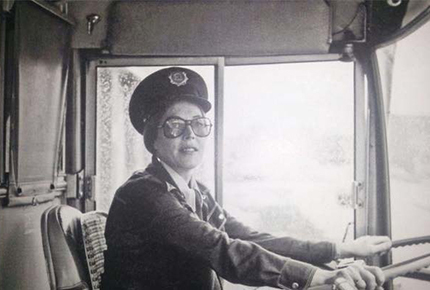 Edmonton's first female bus driver, Kathleen Andrews, has been honoured. "Kathleen Andrews Garage,"a City of Edmonton transit garage, will be located on Fort Road, north of Yellowhead Trail. Andrews Loop, Gate and Way are three roads in the Ambleside Neighbourhood that have also been named in her honour. The South Alberta Light Horse (SALH) is a pan-Albertan regiment, with squadrons in Medicine Hat and Edmonton. The B Squadron SALH is located in the Brigadier James Curry Jefferson Armoury in Edmonton with the Loyal Edmonton Regiment. The SALH is an armoured reconnaissance regiment and part of the Canadian Army Primary Reserve. The SALH has existed historically in various forms since the Northwest Rebellion of 1885. With the advent of the Land Force Reserve restructuring project, the South Alberta Light Horse returned to its reconnaissance roots in 2004. The naming of Light Horse Park will honour the current day South Light Horse, and all that have and continue to serve in that unit. Decoteau Trail was approved in 1971 to honour Alexander (Alex) Decoteau, an Olympic athlete and Canada's first Aboriginal police officer. Though this trail has honoured his name for years, and more recently, Decoteau Way in the Griesbach neighbourhood was named to pay tribute to his service with the Canadian Army, many believed that this devoted Edmontonian was deserving of something more. The story of Alex Decoteau's incredible life needed to be celebrated. 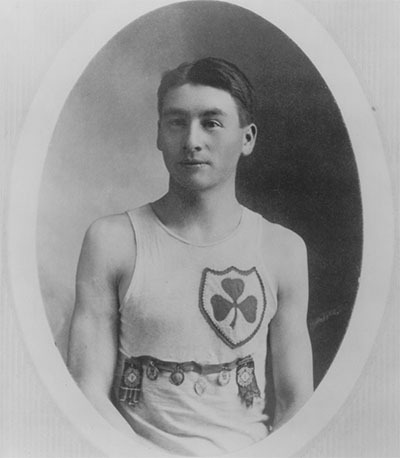 The Naming Committee received an overwhelming amount of support to honour Alex Decoteau's contributions to Canadian heritage, including letters written by grade 5/6 students at Patricia Heights School after a visit to Fort Edmonton Park, where the class learned of Alex Decoteau's many accomplishments. Further support was obtained from Alex Decoteau's grand niece. "Edmonton has a rich aboriginal history and it is fitting that a park in the heart of our city is named for Alex Decoteau, who was a remarkable Edmontonian. Parks bring a sense of community as a place to gather and relax. As an important space, it deserves a notable name and I applaud those who helped make this happen." "Students from Patricia Heights approached us after learning about Alex Decoteau, wanting us to find a way to honour his legacy. The downtown community and Edmonton Police Services got behind the idea, and we are excited to be honouring him through this park." Alex Decoteau Park is located at 10204 - 105 Street NW in the heart of Edmonton's Downtown neighbourhood. As sergeant of the West End Police Office in 1914, he protected the streets of what is currently known as the Warehouse District (105 Street NW to 109 Street NW) in the Downtown neighbourhood. There is a plan in place to commemorate the life of Alex Decoteau in this public park space. The neighbourhood names of Kinglet Gardens and Pintail Landing now complete the Big Lake ASP. Big Lake contains a naming theme of "Native Bird Species of the Big Lake Natural Area". The final neighbourhood within the Meadows ASP has been named Aster. The theme for this ASP is "Trees, Flowers, and Plants Native to Alberta".